Make a lasting impression with our My Air program! 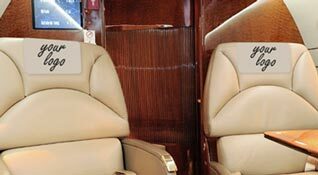 Presidential Air offers logo personalization on the interior and the exterior of our aircraft. We also offer personalization on accessories such as napkins, pillows, catering boxes and much more. Contact us today by phone at 1-888-535-9847 or by email at bookings@presidentialair.ca for more information on making your mark!